How do we analyze our ASO performance? This is one of the most important questions that any good product owner, app marketing lead, indie dev, or other app business stakeholder can ask. The answer to this question is also one that is constantly changing as more data becomes available, such as Google's conversion rate vs the benchmark number, or Apple's source type filter option. In order to help you answer this question in your own organization, consider the following best practices for measuring ASO performance. When optimizing your app's visibility (see the ASO Stack for a definition of "visibility") the KPI for analyzing success is organic downloads. While you will want to look to downloads to determine success (or failure), you can also use impressions to determine most immediately whether your work has produced a significant chance to improve performance (i.e. ranking for more store impressions means you have more chances to acquire downloads). If your impressions rise but not your downloads, then it's time to go back to the drawing board, and/or work on conversion rate optimization. In the first image above, the update (the last gray column) indicates that the optimization did produce an improvement in visibility. This is the data point that helps determine potential but is not the data point to use to determine the success of visibility optimization. This second image shows downloads, or the KPI which determines visibility optimization success. In this image, we can see that the optimization did indeed produce a good improvement in download volume (though notice that the improvement in downloads does not appear as immediate as the improvement in impressions, which can be because the app begins ranking for more keywords and earning impressions, but not at advantageous ranks – see our note on impressions below). This optimization, therefore, is considered a success. To increase your confidence beyond eyeball status, calculate the actual change in download volume per day before and after your optimization and look for at a gain that is statistically significant. Note that downloads (and conversion rate) data often will not be fully updated in store reports for 1-2 days or in some cases up to one week after a real-world day is concluded. This means that you should wait to fully analyze the impact of ASO for at least 2-3 days after the date on which the change went live. Though you can get a quicker, directional sense of performance changes by using a real-time download report or comparing your hourly top chart rank to a previous period. When doing keyword optimization, it's naturally important to monitor the ranks of your keywords over time. Track the keywords which you are optimizing and look for improvements such as the above image. 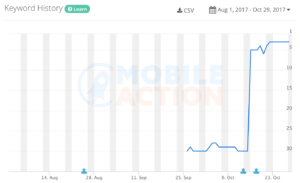 Additionally, many ASO tools like Mobile Action and TheTool (pictured above) also provide details on how many total keywords your app is ranking for, which can be helpful for determining success. But keep in mind that organic downloads is the KPI that determines your true ASO performance. When working to improve the efficiency of your store assets at convincing users to download your app, your best KPI is download conversion rate. In this image above, we can see that the ASO improvements made in version 4 produced an improvement in the conversion rate of this app. If the conversion rate after the update is statistically significantly higher than the conversion rate before the update, then this would be considered a success. While successful CRO will ultimately influence your organic download volume because it increases your app listing's ability to yield downloads, download volume can be influenced other factors which are not always related to your optimization and as such should be considered as a close second KPI. Pay attention firstly to whether your conversion rate improves after an optimization, followed by looking for an increase in organic downloads in the days/week following your optimization. Note that you should use a commensurate level of specificity in reporting as the level of specificity with which you applied CRO to. That is, if you adjusted your screenshots only for your UK localization, then measure your conversion rate in the US, rather than globally. Or, if your optimization was targeted to English speakers, report on your app's change in conversion rate in English-speaking countries only. 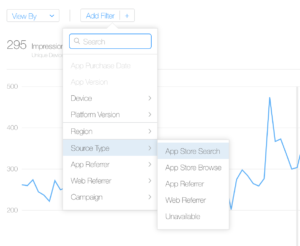 When it comes to iOS it is important to filter your organic download or conversion rate data for the app store browse source type when optimizing elements which only show in a store browse impression, or app store search when optimizing keywords or elements which show in a search impression. If you are optimizing elements that are only seen in the product page (e.g. preview video #2 or the description), then you do not need to filter for source type. Note: we posit that an impression is actually not any time your app appears on a user's screen for 1 second or more, which is the definition according to Apple's documentation. Rather, we assume that the true definition of an impression is when your app's preview is loaded, regardless of whether a user scrolls to the point of actually seeing your app preview or not. For example, when searching for keywords, you will notice that Apple loads 8 apps at once, and when you reach the end of the list of 8 apps, the next set loads. Even if the user does not scroll all the way to app #8, we assume Apple still counts a new impression for app #8. This problem is similar to the "un"viewable impression from display advertising, where impressions are loaded below the fold, yet are never viewed by the user. As it relates to Android, the data points at your fingertips are a slight bit different. Firstly, Google reports on store listing visitors, rather than impressions. Due to this difference in reporting, your Android conversion rate will generally be higher than iOS (if you calculate conversion rate in iOS as app units/impressions) and it is also not possible to assess the aggregated presence of your app in the Play Store (e.g. when your app shows a top chart impressions but is not tapped on). 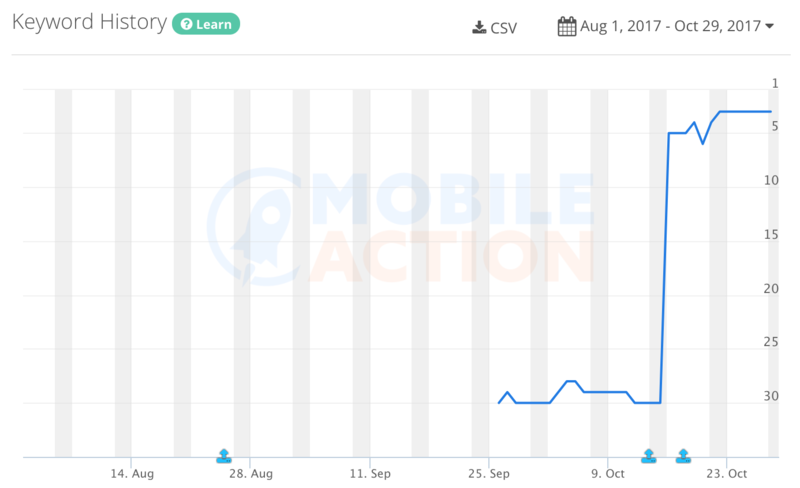 Additionally, be aware that Google reports on installs, rather than downloads (app units). Second, Google provides the amazing conversion rate vs the benchmark data point. From our experience, this data point is the single biggest factor in determining the success potential of your ASO efforts. 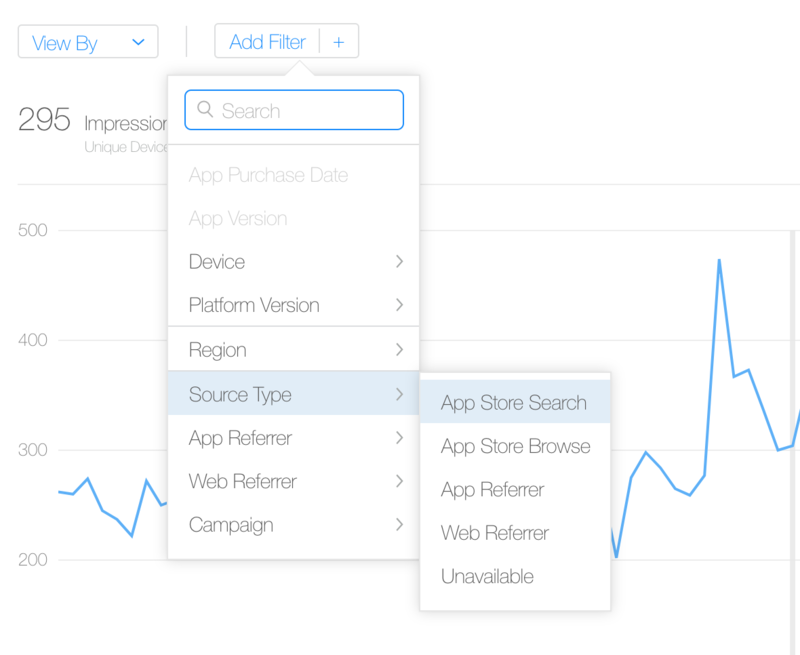 That is, if your app is unable to convert impressions into installs better than peer apps, then Google's incentive to show your app in higher results than other apps is slim-to-none because your app is less likely to provide a good user experience than others, as determined by your app's historic performance profile. Use this number over the general conversion rate number when determining whether your app is in desperate need of CRO or not. That said, be sure to be aware of the caveats of this number.